Boot and shoemakers Cundry & Sons, located at Soho Square, enjoyed the patronage of Queen Victoria (as well as other members of the Royal family) for a number of years. 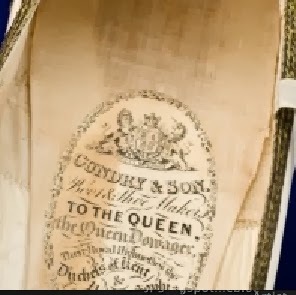 I have written previously on these makers regarding her 1840 wedding slippers, one of the highlights of the Northampton Shoe Museum (See: http://silkdamask.blogspot.com/2012/09/whats-in-label-3-queen-victorias-1840.html) Given Queen Victoria's keen understanding that she could encourage patronage of UK designers through her personal selections (such as her use of Honiton lace for her wedding gown as an attempt to assist the flagging lace making industry), it was not surprising to see another pair by the same London shoemakers as part of her footwear collection. Made for her after the wedding slippers, a similar pair (1840-48) is housed in the collection of www.ScienceMuseum.uk.org (Object A135559) According to both sites, Queen Victoria had nine-inch feet, which translates in approximately a size 5-5.5 (USA), 3–3.5 (UK) and 35.5 (EU) in today’s sizes. The gold trim, laid in "stripes"contrasts elegantly with the cream satin slippers. 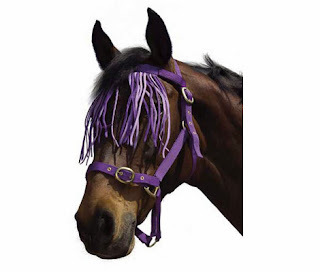 The diminutive rosette and dainty ankle ribbons add to the well balanced composition. 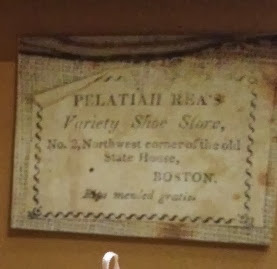 The thin leather soles, delicate construction and fabric indicates they were clearly intended for dancing or indoor use. This past weekend, while visiting my older daughter at UMass-Amherst, I had the opportunity to spend a truly exceptional afternoon at Historic Deerfield (Deerfield, MA), attending the "Celebrating Fiber Arts" exhibition. Located in the Helen Geier Flynt Center, I had reason to anticipate a delightful excursion through these collections. On a previous visit in 2011, I had presented a paper on Georgian architecture and design at the annual fall symposium. More recently, I visited the textile collection and immersed myself in the fabulous footwear for my current research on Georgian shoes in Colonial America. This visit was decidedly different: I was there to savor, discover, and, simply, enjoy. No time frame or pressing goals to be met. No one else present in the gallery, leaving me the opportunity to immerse myself in the surroundings without the need to jostle for a perch. So many aspects of this installation and its rubric of space make it noteworthy. 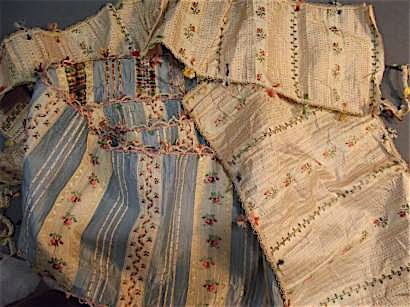 I find compelling the fact that the primary textiles associated with historic garments have been organized thematically: cotton, linen, silk and wool. Within this format, the curatorial staff introduces select items or recent acquisitions each season, on a rotating basis. This was my second visit to the "rotation," and I found it just as interesting as the first. While I enjoy blockbuster fashion exhibits as much as anyone, the intimacy of the space and the careful – might I say reverential? - selection of objects (38 according to press materials) allowed the liberties of close inspection and reflective inquiry. Despite working closely with museum collections for over 25 years, I felt as though I was making new discoveries with each step. Do put this in your planner – the exhibition closes on December 29th! A few of my favorite "interactions." All photos are courtesy of Historic Deerfield (www.Historic-Deerfield.org) and a list of captions may be found at the end of this post. The author thanks Ned Lazaro, Collections Manager and Associate Curator of Textiles, for his assistance. - Court dress, blue & white silk brocade, woven in Lyon, France, c.1760. Note expansive panniers. - Detail, blue & white silk brocade Court dress with "fly” or floss fringe, c.1760. - Man's early 19thc. linen plain weave shirt. 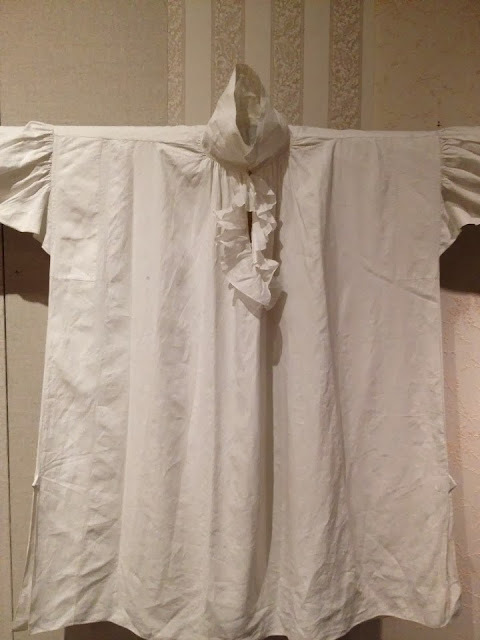 Fabric, probably England; garment, probably American. - Ladies' wallet or pocketbook (1750-1800) is rare in that it is attached to a known maker, Rebecca Kingsbury (1713-1807) of Dedham, MA. Rebecca was a schoolteacher in the 1730s before marrying Nathan Gay in 1740. Wool, silk, linen & pasteboard. Historic Deerfield’s costume and textile collection has long been considered one of the finest in America. Begun by the museum’s founder, Helen Geier Flynt, the collection features a vast array of costumes, needlework and domestic textiles which are displayed on a rotating basis. Newly installed in this permanent gallery for the season are 38 exciting examples of American and European clothing, accessories, textiles and needlework from the 17th century through the mid-20th century. This past weekend, after many years of talking about it, we went with friends to the Higgins Armory Museum in Worcester, Massachusetts. It has been open for 83 years in a building designed to house the collection, but financial demands have forced the board to close the museum at the end of 2013. However, the collection will be transferred to the Worcester Art Museum where a library will be converted into new gallery space to house the collection and the library will move to new quarters. So at least the collection will remain in the New England. As a child I had knights and a castle, so this was a delightful afternoon. I knew that armor was used for centuries, but it was the section of mid-sixteenth century armor the struck a cord. The distance between the 1640s and the 1740s is in certain ways immeasurable (the divine right of kings and the modern political era is one example), but thinking specifically about the years 1646 and 1746 took me aback for a moment. As fate would have it, in 1646 Charles I was still trying, albeit unsuccessfully, to contain the revolutionary forces that would eventually unseat and behead him and in 1746 George II was in pursuit of Charles Stuart better known as Bonnie Prince Charlie, the great grandson of Charles I, in order to maintain his crown and the Hanoverian line. In those one hundred years troops in woolen redcoats replaced regiments in armor, and the battles that consumed nations now consumed fields. I find it somewhat ironic that the redcoat that began with the Parliamentarian forces of the Civil War (1640s) would in time signify the King’s own troops (1740s), but history is full of such details. As I looked at the armor and the martial paintings that accompanied it, I wondered, in addition to all the other factors that influence how we perceive and dress ourselves, if the defeat of the Stuarts was one of those watershed moments that go unnoticed. Was this the end of the fantasy of the feudal order and all of its accoutrements? The sword, a significant and evolved feudal emblem as any, was still used by some, but not required outside of the Court, a sure measure of its decline. Certainly by the 1750 the attitude in men’s clothing began the slide toward dominant and increasingly conservative uniform--the suit. 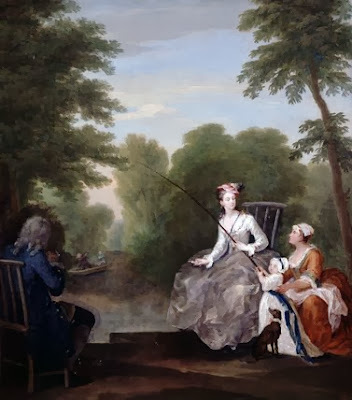 While the fabric of men’s clothing during the second half of the long eighteenth century might still be more decorative than any modern concoction, the flair began to subside particularly with the growth of the middle-class. Was the defeat of the Stuart pretensions the last nail in the coffin of the medieval and renaissance ostentatious male display? It is hard to say, but the distance between 1646 and 1746 was never so apparent to me as it was on that Saturday afternoon. This uniform was worn by the British Army officer, Richard St George. He was a Colonel in the 20th Regiment of Foot between 1737 and 1740 and later commanded the 8th Dragoons until 1755. Dragoons were trained to ride on horseback but to fight on foot as infantrymen. St George may have served at the Battle of Dettingen during the War of the Austrian Succession. This all leads to the last thought of this exercise and that is, a question that often is asked of museums, or rather the employees of museums...“What was the point of the exhibit and did it reach its intended audience?” I can’t think that anyone really sat down and created an exhibit to trigger my experience with 17th century armor. That to me is the telling bit; education or the sharing of information is informed as much by the knowledge of the audience as it is by the knowledge of the institution and that the unintended outcome, although seemingly valueless to the perceived outcome, is of importance, at least the mind engaged with it. Would I have made the connection without the exhibit, perhaps, but as I am not surrounded by either the 17th or 18th centuries, I think it would have taken longer, if at all. After all, information without connection is simply a list of facts. 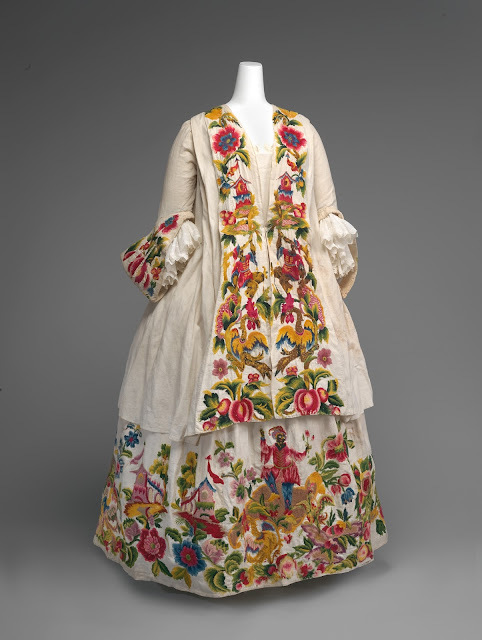 This lively Italian Late Baroque/Rococo linen casaquin/caraco jacket and skirt, embroidered with wool thread (c. 1725-1740, epitomizes the characteristics of the period: exaggerated, large scale motifs and easily accessible details. Add to this a sense of movement, depth, high color, and they all combine to create drama, exuberance & grandeur! The dress suggests a theater or an opera narrative. By the time this garment was complete, the transition to the Rococo was well underway. Whether we view it as a form of music, art, architecture, theatre or fashion, this dress embodies the époque. Look closely at the scale of the figures along the lower portion of the dress. 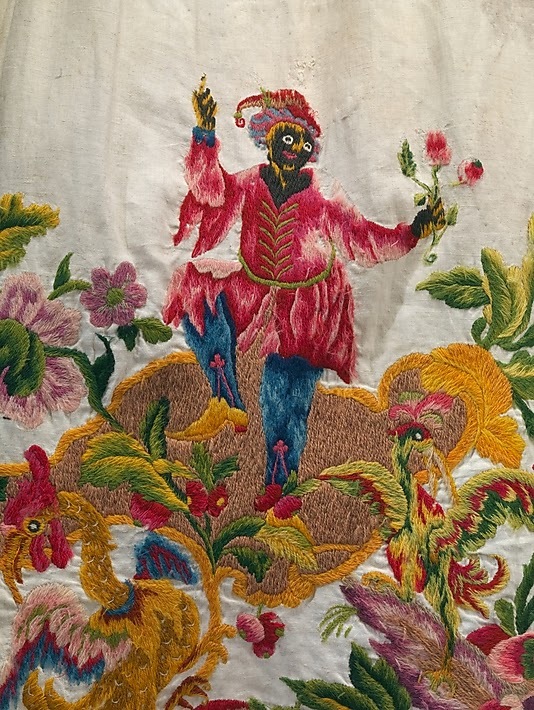 Full of flourish, the dancing jesters, holding flowers rather than scepters, would have been recognized in most parts of the early 18th century world by the elite (who were wealthy enough to have such extensive ornament decorate their garments.) The figures are intertwined with fantastical phoenix-like creatures (known as Hoho birds, Asian symbols of good fortune), large-scale, brightly-hued flowers, references to Chinoiserie and elaborate foreign, dream-like landscapes. 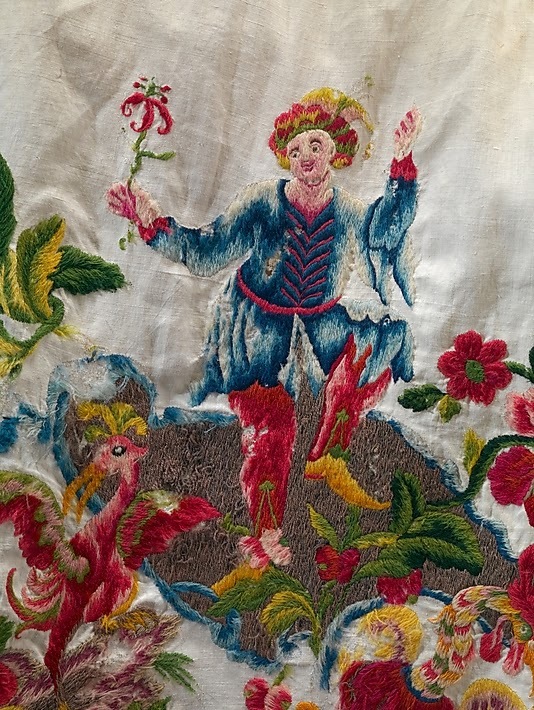 Note the attention to detail of the jester's clothing: vibrant tunics with pointed hems and sleeves, traditional cap with bells. As mentioned above, the figures are entwined with the Hoho birds. 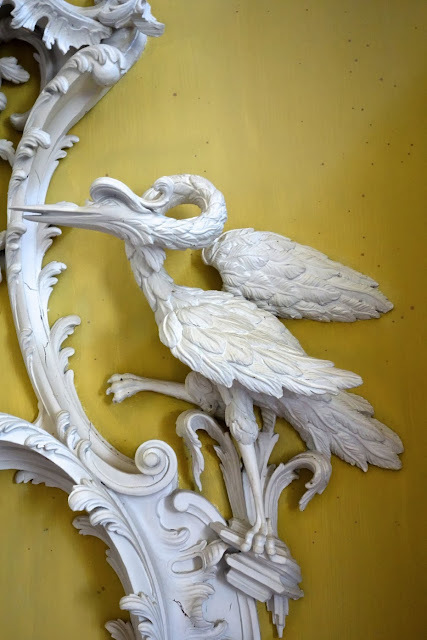 Some of the best examples of these carved creatures are at the National Trust's Claydon House (1751-1771). They carved of wood by Luke Lightfoot, responsible for most of the astounding Rococo carving throughout. 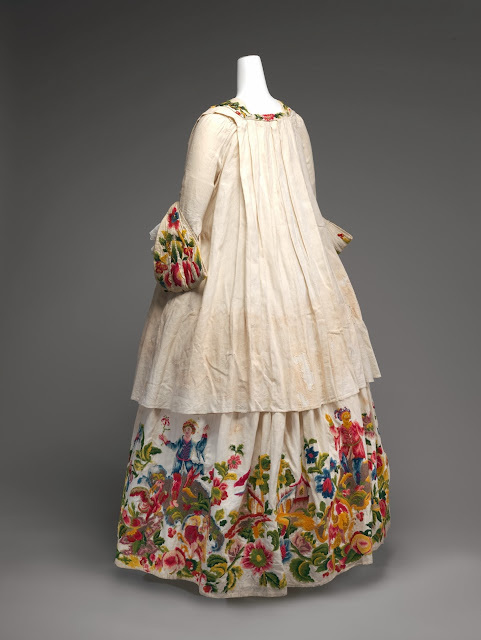 The Metropolitan Museum notes: The exuberant and vividly colored motifs are displayed to advantage by the flowing lines of the casaquin and the rounded petticoat. This type of two-piece dress, derived from a working-class costume, was adopted as fashionable informal wear in the 1720s. Wealthy women would have worn the petticoat over a pannier to create the desirable contemporary silhouette. The exceptional nature of the embroidery on this particular costume suggests that it was intended to be worn for a special occasion. Mitchell at Mrs. Rowson's Academy"
In a quiet corner of New England, in a large but unassuming Georgian home, during the early years of the new nation, lived a young woman whose life was typically New England—and, yet, surprisingly unfamiliar to most New Englanders. 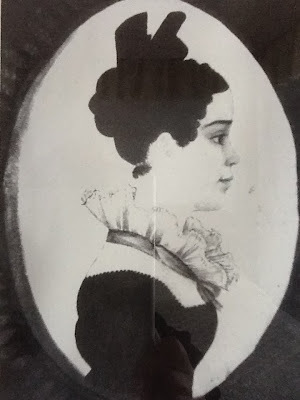 Her name was Myra Montgomery (1794-1817), and her abbreviated life of twenty-two years was played out along the Connecticut River, where she learned to ride and sleigh along cornfields, and in Boston, where she learned literature and the finer arts of genteel society at Mrs. Rowson’s Female Academy. Few of us who know and love the history of this region realize that the lives and loves of those who came before us spanned the hundreds of miles of unpaved post roads that connected one corner of our region to another. This is Myra’s story. I have had the good fortune to work with this previously unpublished cache of letters. They reveal her joys and sorrows; her erudite use of the pen and playful language, her hopes and disappointments. We come to know her as an intelligent young woman of the early republic, who is looking forward to travel beyond her childhood home and marriage to Horace Henry Goodman, her fiancé. All were cut short by her death of consumption at age twenty-two. One of the Montgomery girls, probably Myra. We can still enter her world. 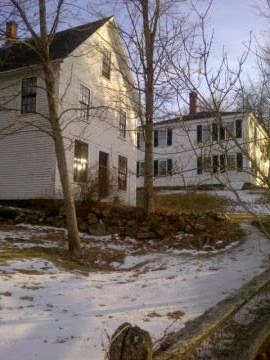 In addition to the letters themselves, the Montgomery House (c. 1793) still stands. Here, we can find Myra’s bedroom on second floor, adorned with stenciled walls, where she penned her letters to Horace. The classic Georgian vernacular structure has only had five owners, and the current residents are gracious and are always happy to open their lovely home. If you would like to learn more about the life of this young woman and her early 19th century world, you may purchase individual copies of Historical New Hampshire, Fall/Winter 2013, Donna-Belle Garvin, Editor.